Best cruises ever, fantastic crew with special attention to my husband with walking issues! 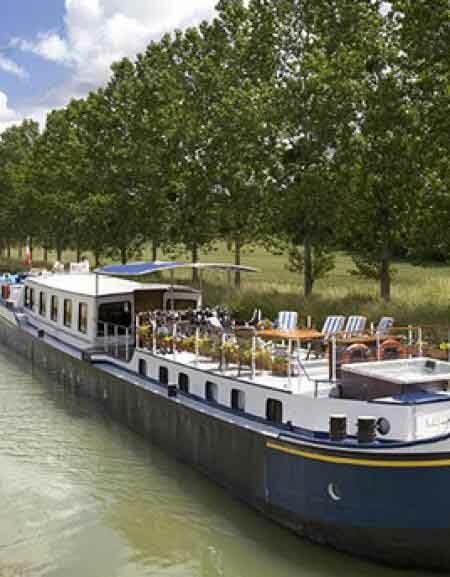 To step aboard this hotel barge is akin to entering the palette of an impressionist artist. L'Impressionniste is beautifully decorated with wall colourings, prints and fabrics of the turn of the century era. All cabins can be configured as double or twin. You may choose to relax by using our 12 bikes or sun deck with Jacuzzi. You may even take a hot air balloon flight (an optional extra on this cruise). Guests are met at the centrally positoned Hotel Westminster in Paris and transferred by private chauffeured minibus to the elegant L'Impressioniste. A Champagne reception welcomes you on board and the opportunity to meet the Captain and crew. Then enjoy your first dinner on board. We begin the cruise along the delightful Canal du Bourgogne passing through sleepy villages and pretty lock houses. After lunch, we visit Clos de Vougeot, headquarters of the esteemed Chevaliers du Tastevin, who award a special prized label to the finest Cote d'Or vintages each year. We will tour the iconic cellars. On the way back to the hotel barge, we enjoy a tasting of fine Burgundy wines in another long-established Domaine. After breakfast, enjoy a walking tour of Dijon, including a visit to the vivid produce markets, mustard shops and the impressive Notre Dame de Dijon, or take time for some excellent shopping in the small boutiques. Return to L'Impressioniste for lunch and a leisurely afternoon cruise to La Bussiere, and perhaps a walk or cycle to the next lock or two. After a short morning cruise, we set off on a drive through the vineyards, stopping en route at the Vigne de L'enfant Jesus, a famous vinyeard owned by the Domaine Bouchard Pere et Fils. There, a wine expert will give us a real insight to the production of the Domaine's Grand Cru and Premier Cru wines. We continue to Beaune, capital of Burgundy wine country, for a winery tour and a private tasting of Bouchard Pere et Fils wines before enjoying a gastronomic lunch in the orangery of the Chateau de Beaune. Afterwards, we step back in time in the facinating 15th century Hotel Dieu Hospice with a wealth of fascinating exhibits. There is time to explore the town, before returning to the barge for a short evening cruise to Pont d'Ouche. This morning we cross the aqueduct to our mooring at Vandenesse-en-Auxois. After lunch on board, we visit this fairytale medieval village, craft shops and castle. Once an outpost of the Dukes of Burgundy and offering a fine view of the feeder lakes, canal and surrounding countryside, Vandenesse-en-Auxois stands proud above the valley below. Do remember to take both day time and evening photos! The chateau takes on a wonderful beauty when lit up at night. Our last day's leisurely cruise takes us to the canal summit, 1250 feet above sea-level, just before the Pouilly tunnel. This afternoon we visit the moat-encircled Chateau de Commarin. Owner and current occupier, Count Bertrand de Vogue will be your guide. He is the 26th generation of his family to live here! A superb, close-up encounter with birds of prey in a fine falconry display takes us back to Medieval times. We return to the barge to our wonderful Captain's Farewell Dinner on board. After breakfast, guests are transferred to the Westminster Hotel in Paris.